So today I got a couple of text, asking me about the challenges I talk about on the podcast show. I was asked if I could explain in more detail what challenges I am doing. I am going to post photos of the 30 day challenges that I am overcoming!!! LOL!!! I am going to stop saying I am struggling with these. The challenges below are not difficult to do, however staying consistent in them is my battle. The first challenge is the pushups. At this time I can not do a floor push up. 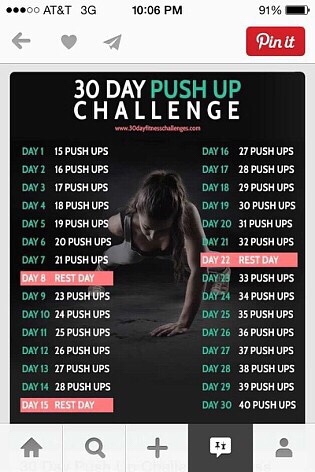 I do this challenge as a wall push up. I will insert a video to show how to do those. 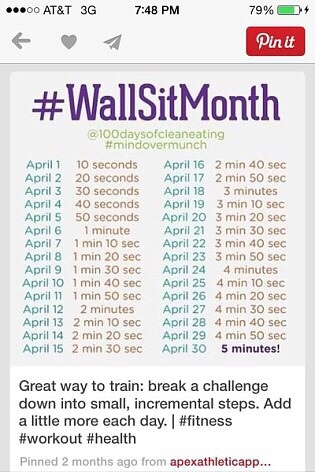 The second challenge I do is the wall sit! The third challenge is my hardest. It is a plank. Now there is an even easier level to start with on planks but I chose this one. I will insert the level before this one in video format. Challenge 4 is Yoga moves for beginners. I am not really into Yoga on a spiritual level. I am using the physical aspect for my body. I have a lot of lower back issues and also tension in my body. I have found that these moves are very helpful for me before and at the end of my work day. Okay so these are the challenges in which you hear me vent about on the Kickn It Java Style Podcast or see me posting about on social media. I would love to have you join me in this journey and challenges.